On the day that American aviator Charles A. Lindbergh successfully completed the first non-stop solo flight across the Atlantic Ocean in the monoplane Spirit of Saint Louis way back in 1927, I thought it might be fun to post a vintage aviation postcard. I'm no lover of flying but do appreciate the beauty of aeroplanes and used to spend hours glueing plastic Airfix model kits together as a kid! This classic souvenir airport postcard features Rome's main airport Fiumicino, which in what is surely an attempt to confuse foreign travellers, also goes by the name of Leonardo da Vinci International Airport, and shows an Alitalia plane in flight and a tail view of a TWA Boeing 707 numbered N763TW sitting on the tarmac in front of the terminal. 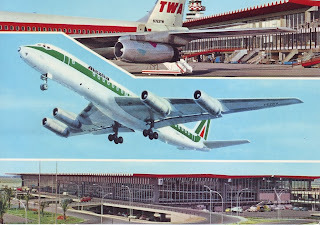 Trans World Airlines, of course, no longer exists, making this 1978 postcard even more of a curiosity, whilst Italy's flagship airline is today also struggling to survive. Curiously, Charles Lindbergh was also a player in TWA's corporate history. When Transcontinental Air Transport (T-A-T) and Western Air Express were forced to merge into Transcontinental & Western Air (T&WA) at the insistence of the Postmaster General Walter Folger Brown, who was looking for bigger airlines to give airmail contracts, Lindbergh was one of the famous aviation pioneers who would help earn the new company the epithet "The Airline Run by Flyers" having been previously involved with Transcontinental. In fact, on October 25, 1930, the airline even offered one of the first scheduled coast to coast airline services named...wait for it... the Lindbergh Route! 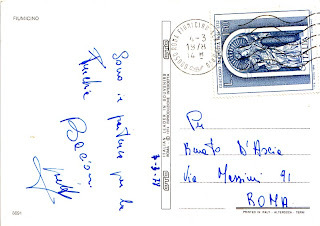 This postcard also has a spectacular reverse side with a lovely commemorative postage stamp issued in 1976 to celebrate the 320th anniversary of the birth of Italian sculptor Giacomo Serpotta and featuring his work called "Fortitude" which is found in the Oratorio del Rosario di San Domenico in Palermo, Sicily. 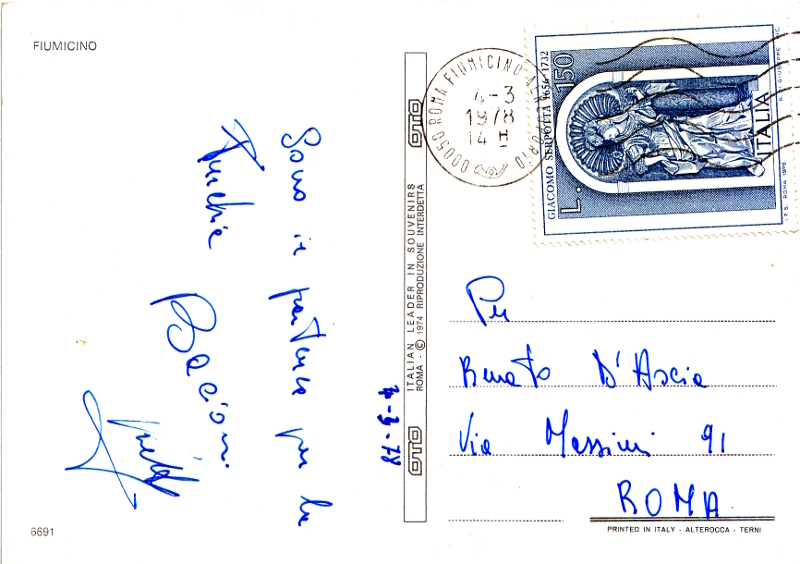 The postcard was posted in 1978 although the copyright notice is dated 1974. It was printed by Italian postcard giants Alterocca from Terni although the image is copyrighted to OTO who modestly describe themselves as “The Italian Leader in Souvenirs”! Until buying this postcard from a market stall in Rome recently, I confess that I'd never actually heard of the German actress Lotte Neumann. I fell instantly in love with this vintage postcard, however, and was intrigued by its seemingly demure subject with an almost Mona Lisa-like half smile on her lips. My attraction to the card was also the fact that it has a perfectly smooth matte surface and is almost certainly a collotype from a monotone photograph. Collotypes were very poular in Europe and the process was prized for its fine detail. In fact, the curls in her hair and the folds in her crushed velvet dress are very clear. Whilst the card is uncirculated with a divided back, the heyday of Neumann's career as an actress during the 1920s probably dates its issue to that golden decade of postcard production. Born in Berlin in 1896 as Charlotte Pötler, Neumann is listed on IMDB as appearing in no less than 45 movies. The most famous of those films today is probably the Ernst Lubitsch-directed Romeo and Juliet in the Snow in which she played the lead. 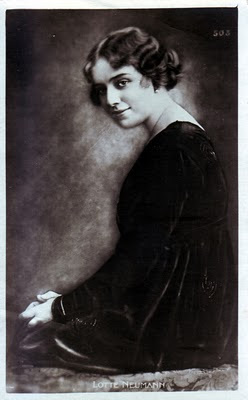 What is particularly intriguing about her is that she was also a film producer, founding the Lotte Neumann-Film-GmbH in 1916, which lasted until 1919. Unfortunately for Lotte, her protracted divorce case, which lasted from 1929 to 1932, effectively ended her career as an actress. Her involvement with cinema continued, however, and from 1933 she worked as a screenwriter under the pseudonym C.H. Diller, marrying fellow screenwriter Walter Wassermann in 1935 with whom she would also share a professional partnership until 1944. Lotte Neumann died in 1977 in Gaißach, Germany, although I've found nothing on the Internet that fills in the gaps as to what she did for the remaining thirty odd years of her life! 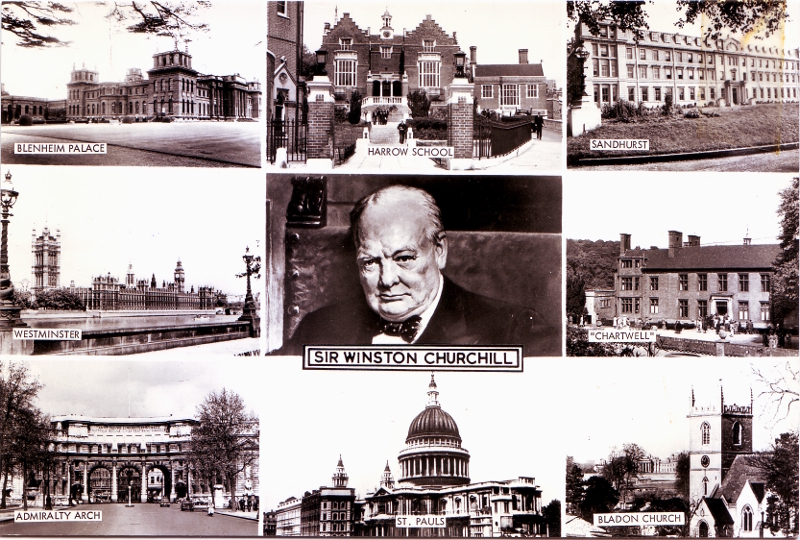 On the day following the General Election in the United Kingdom and with things still unclear as to who will govern the country I thought I'd take a closer look at this vintage 1960s postcard featuring one of the country's most famous Prime Ministers - Sir Winston Churchill. This real photograph postcard is uncirculated, but was certainly issued after his death in 1965 as one of the vignettes highlighting important locations in the statesman's life features “Bladon Church”. Churchill was buried in the family plot at St Martin's Church, in the village of Bladon, not far from his birthplace at Blenheim Palace, which is the first of the images on this postcard. The state funeral service was held at the far more ostentatious setting of St Paul's Cathedral. The postcard is a potted biography of sorts - his school days at Harrow School are followed by those at the Royal Military College, Sandhurst (where, incidentally, he struggled to pass the entrance exams and was accepted only on his third attempt). 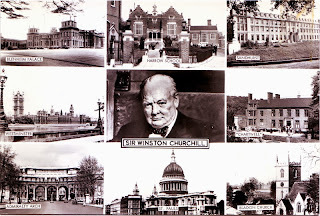 His years as Prime Minister from 1940 to 1945 and again from 1951 to 1955 are represented by the Palace of Westminster, whilst his retirement and final years are depicted through his country home in Chartwell. Churchill also served as First Lord of the Admiralty in both the First and Second World Wars, living in Admiralty House during those years, which I assume is the reason for the inclusion of Admiralty Arch. The postcard is stamped Frith's Series Reigate on the reverse and was published by Francis Frith & Co., a true giant in the vintage postcards world. The photographic views publishing company was first established in 1859 by Francis Frith, a British photographer and Quaker minister who had made his name with photographs he had taken on his travels in the Middle East. He then embarked upon an extraordinarily ambitious project – to photograph every town and village in the United Kingdom, particularly those of historic interest. Whilst he initially took the photos himself, he eventually hired others until Frith became one of the largest photographic studios in the world. From the early 1890's the company focused primarily on postcard production, with his sons taking over the business after Francis’ death in 1898. When the company eventually closed for good in 1970, there were serious concerns about the future of the vast photographic archive. Help came initially in the unlikely shape of the tobacco company Rothmans who bought and saved the collection. In 1977 it was sold again, this time to John Buck who formed the present day company - The Francis Frith Collection - which continues to publish photographs from the Frith archives to this day.